This grandma loved embroidery, farming, cooking and spending time with her husband and children. Friends and relatives enjoyed grandma’s embroidered pictures, but at age 79 her arthritis made it too painful to use the needle. She could have simply given up, sat around watching children play and listened to radio shows. But this was no ordinary grandma! At her sister’s suggestion, she took up a different creative outlet: painting. The hand movements needed to paint were easier on her arthritic hands. This farm girl’s artwork soon became iconic for wholesome American life as well as productivity during the golden years. Her artworks were reproduced on Christmas cards and fabrics the world over. 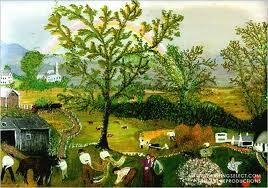 Grandma Moses’ last finished work — Rainbow — was painted at age 100, in the final year of her life (see image above). It surely oozes symbolism.